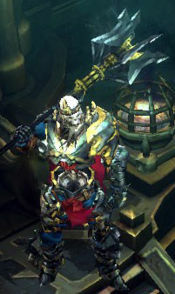 For all of you that really like to crush the undead throngs of darkness, we have put together a small guide to the Undead of the Diablo Universe. The undead are a major part of Mephisto‘s, Diablo‘s, Baal‘s and other minor dark/ demonic powers’ forces and for fans of Diablo lore, there are actually a lot of things you might not know that much about (yet)! There is more to the topic of the undead than “magically enhanced inanimate objects”. The Great Cycle of Being that the Priests of Rathma ( Necromancers) live by is holding secrets to life and death that beings outside the realm of Hell can use, for good or bad. Even a simple thing as healing is part of the Cycle (not that healing is important for undead; that’s about the only topic that so far is unknown about them), and there is much to discover of this mental mindset. Outside the general guide for undead, you’ll find a very detailed description of Diablo Skeletons. These creatures are one of the most common undead creations, and the magical science behind them can truly be fascinating. Even if you do not like the idea of a walking heap of human bones, you should probably read up on the facts behind them as to easier neutralise their threat on Sanctuary.